In this column, we ask our favourite writers what they always reach for in the kitchen drawer. Bee Wilson makes the case for kitchen scissors. A friend of mine swears that scissors are the best tool for cutting pizza. I don’t agree. To wait until the moment when pizza is cool enough to pick up and cut with scissors would be to miss the moment when it is perfect to eat. The thought of molten mozzarella gumming up the blades also does not thrill me. I’m open to persuasion though, because, if in doubt, I’d rather use a pair of kitchen scissors than a knife. What could be handier for snipping herbs, trimming chicken, tailing green beans, turning pancetta into lardons, cutting pieces of fish to put in a stew, slicing dried apricots or fashioning circles of baking parchment for cakes? Then again, I suspect that their main use is getting inside difficult packaging. Either way, their presence is as reassuring as string. You can tell how useful kitchen scissors are by the frequency with which they are purloined and taken off to other parts of the house. 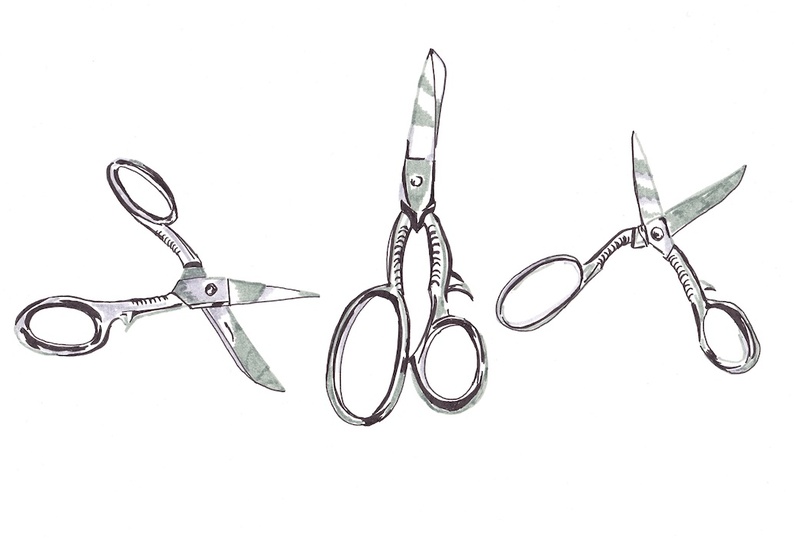 The main differences between kitchen scissors and any other kind are washability and power. Sarah Jay, author of Knives Cooks Love (2008) refers to kitchen shears as ‘scissors on steroids’. I recently ordered some beautiful kitchen scissors from Ernest Wright & Son Ltd, the venerable Sheffield scissor-makers. The handle has a built-in bottle opener and the blades are powerful cutters that gleam like a Bentley. The kitchen scissors I’ve been using for years are nothing like as impressive, but I’ve grown fond of them. They came from John Lewis and have a black plastic handle and stainless steel blades that have greyed in the dishwasher. Still, they do the job. The bottom blade is serrated, which helps to grip whatever you are cutting. The top blade makes a satisfying click as it shuts. There are many reasons to love kitchen scissors. There is – hooray! – no board to wash up. You are closer to the ingredients, because you are handling them. Each snip feels like a delicate decision. When chopping herbs, scissors do less damage to the cell walls, keeping more of the brightness. But the real joy of scissors is the way the cutting motion feels like an extension of your own hand muscles. Maybe you are doing nothing more than chopping mint for a salad, but for a moment, you are Wolverine.